Shoemaker, Angel Cordero Jr., Andreas Suborics and Kieren Fallon, and by equally legendary trainers such as Charlie Whittingham, Andre Fabre, D. Wayne Lukas and Aidan P. O’Brien. We are speaking, of course, about the Grade 1 Arlington Million, a race which will be run for the 25th time on August 11, 2007. 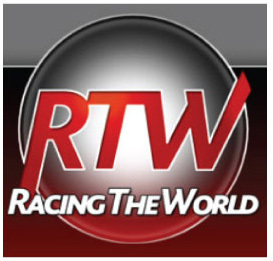 Its concept – to blend in with Europe’s major pattern races – was initially developed by Arlington Park’s late president, Joe Joyce Jr., with an assist from Joe Hirsch, the longtime executive columnist for Daily Racing Form. The best laid plans of mice and men sometimes go astray, but these plans didn’t. European participants have shipped Thoroughbreds over for the Arlington Million from the get-go. Horses from Great Britain, Ireland and France have frequently run in the race, and Germany has been represented as well. “Bursting with pride,” is the way the editors of the magazine Pacemaker International described their reaction, when England-based Teleprompter registered a wire-to-wire score in the ‘Million in 1985. Teleprompter is one of seven foreign-based horses to have won the ‘Million, the others being Tolomeo, Mill Native, Dear Doctor, Silvano, Sulamani and Powerscourt. Horses from Hong Kong and Brazil have also run in the race. Consider the drama that has been attached to the Arlington Million. Its inaugural running in 1981 was decided by a nose, with the 11-10 favorite, John Henry, just edging out a 40-1 longshot, The Bart. The ‘85 edition was run on-site only 25 days after Arlington’s grandstand and clubhouse were razed by a spectacular fire. Arlington’s crowd numbered 35,651 that day. It was one of the most poignant racing cards ever staged anywhere. At the culmination of the year, Arlington Park received a Special Eclipse Award. Well done. Well deserved. Drama may manifest itself, though, in many forms. There was the 1991 renewal of the Arlington Million, won by the appropriately-named Tight Spot, when less than a half-length separated the top four horses at the wire. And in 2002, in the Kodak moment of all Kodak moments, a crazy quilt could have appropriately covered the first six horses at the wire. The winner of that one was Beat Hollow, trained by Bobby Frankel and ridden by Jerry Bailey. The margins of difference between the top six finishers were a head, a nose, a head, a nose and a neck – all of which also added up to less than half a length. The summer months also contain outstanding turf events at other U. S. tracks. Monmouth Park has the United Nations Handicap, a race that dates back to 1953, and whose winners include Round Table and Dr. Fager. And Saratoga has the Sword Dancer Invitational Handicap, which dates back to 1975, and whose winners include Theatrical and With Anticipation. Both of these races also bear Grade 1 status and have lengthier histories than Arlington’s centerpiece. But, these days, the Arlington Million remains a step above and a degree apart. Maybe the reason has something to do with its locale, a track in Arlington Heights, a northwestern suburb of Chicago. Terrific sports town. Home of the White Sox, Cubs, Bears, Bulls and Black Hawks, where Tunney beat Dempsey with an assist from the ‘long count’, where Joe Louis took the heavyweight championship from Jim Braddock where Sid Luckman, Bobby Hull and Michael Jordan performed their derring-do, where Babe Ruth called his shot, and where Ernie Banks always wanted to play two. 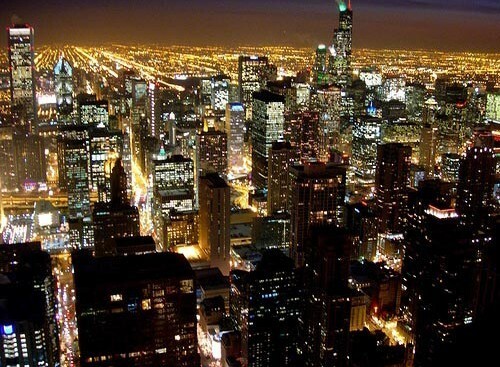 Chicago’s the place where Al Capone sold booze and shot up his rivals. For relaxation, he would sit in his box at Arlington and bet the races. And, oh yes, make no mistake, Alphonse loved the ponies. The dog track his money helped build in the Cicero section of the city, Sportsman’s Park, was subsequently converted into a horse track. Unfortunately for Capone, though, the first horse races at Sportsman’s were held the day after the Feds sent him to the penitentiary in Atlanta. Certainly, the reason the Arlington Million is so special has got something to do with the Chicago area’s racing history. It was at Hawthorne where Sun Beau won consecutive runnings of the Gold Cup in 1929-’30; at Lincoln Fields where Alsab registered his first career stakes victory in 1941; at Washington Park where Nashua defeated Swaps in their match race in 1955; and at Arlington where Dr. Fager clocked his world record mile of 1:32 1/5, winning by ten-lengths with a 134 pound impost, in 1968. It is, indeed, a marvelous heritage, and the Arlington Million has added many chapters to it. Back in ’81, Arlington was owned by the Gulf & Western conglomerate and managed by Madison Square Garden Corporation. The latter company was headed by New York sports man Sonny Werblin, who was one of Hirsch’s closest friends. 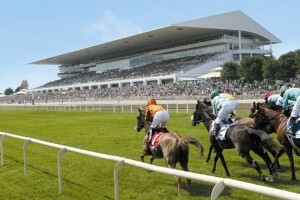 The inaugural ‘Million was to be the first race held anywhere in the world for a seven-figure purse. Such circumstances in spired NBC to televise the race, although the network got one significant factor wrong their program slot having run out of time, they took a guess and called The Bart victorious, then signed off. But the photo revealed John Henry, under Shoemaker, had actually gotten his nose to the wire first. Twenty-six years after the fact, John Henry’s trainer, Ron McAnally, voices no ill will about the NBC call. “I thought we had lost, too,” he said. “But, you know, ‘Shoe’ had a way of getting those head bobs.” Today, there is a set of statues at Arlington commemorating the finish between John Henry and The Bart. Look at them from one angle and it seems that John Henry won. Look at them from another angle and it appears the winner was The Bart. Look at them from still a third angle and it looks to be a dead heat. John Henry won the Arlington Million again in 1984 – that was the year before the fire. By that time, Arlington Park had new owners. To wit: a four-member partnership consisting of Joyce, Sheldon Robbins, Ralph Ross and Richard L. Duchossois. 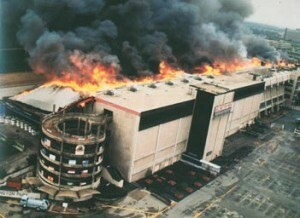 In 1986, the year following the fire, Duchossois bought out his partner and assumed full control of the track, along with it’s signature event. “Dictatorial” has often been a word attached to the Duchossois ownership and management style (although it is far more often uttered in private, and almost never in public). But he can be enormously generous during the days immediately following the fire, he instructed the track kitchen personnel to continue feeding everybody on the Arlington backside, and to send the bill for the whole thing to him. And Duchossois undeniably loves horse racing. He could have closed the track and pocketed his share of the insurance money. But, Duchossois, instead, chose to keep Arlington Park and the Arlington Million alive. Temporary bleachers, tents and other facilities were erected, and in ’86 the Arlington Million culminated a 13 day International Festival of Racing. In 1987, Arlington conducted a 91 session meet which extended through Labor Day, when Manila closed out his career with a 1 ½-length victory in the Million and Arlington set a single-day Illinois pari-mutuel wagering record of $4,590,350. In 1988, while new front-side facilities were being built at Arlington Park, the ‘Million was run at Woodbine near Toronto in Ontario, Canada. That’s the year Mill Native won, returning $83.20 for a two-dollar win mutuel, the highest to date for a race in which favorites have been victorious ten times (a percentage of 41.7). 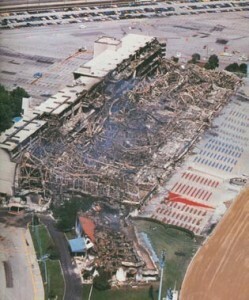 In 1989, a rebuilt Arlington hosted the ‘Million before a crowd of 30,129, at least half of the arlington facility was destroyed by fire in 1985 which seemed to be families with young children, enjoying the day on blankets spread on the lawn adjacent to the grandstand’s north side. That ’89 running was won by Steinlen, trained by D. Wayne Lukas his son, Jeff, was there to handle the saddling chores. 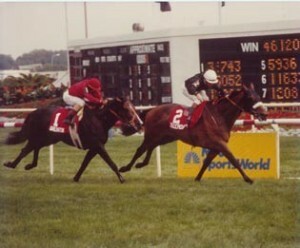 Lukas won the Arlington Million a second time with Marlin in 1997. He is one of a pair of trainers to have won the race twice the other is Frankel, who was triumphant with Chester House in 2000 and with Beat Hollow in ‘02. But Lukas and Frankel remain one short of the victory total achieved in the Arlington Million by McAnally, who, in addition to his two wins with John Henry, won with Tight Spot in ’91. And the late Charlie Whittingham also sent out a trio of ‘Million winners: Perrault in 1982; Estrapade in 1986; and Golden Pheasant in 1990. Estrapade remains the only distaffer to win the ‘Million she was six years old at the time, and her victory helped gain her an Eclipse Award as North America’s champion female turf competitor. Foreign horses like teleprompter have had success in the Million. The list of jockeys with multiple victories in the Arlington Million include Laffit Pincay Jr., Cash Asmussen, Jose Santos, Stevens and Bailey, all having won the race twice. Stevens would actually have three, had not Storming Home commenced his rodeo act in 2003. The following year, Powerscourt became the second consecutive horse to be disqualified in the ‘Million, for drifting in badly in deep stretch. After the stewards looked at the video-tape, Powerscourt’s number went from first to fourth on the Arlington tote-board, and Kicken Kris’s number was elevated to top position. Kicken Kris was trained by Michael Matz, who subsequently trained the ill-fated 2006 Kentucky Derby winner, Barbaro. Meanwhile, Powerscourt was not through. He returned to the Arlington Million in 2005 and, under Fallon, registered a professional, authoritative three-length triumph. No inquiries or claims of foul this time. Final time of 2:03.38, which is pretty impressive for ten furlongs on a yielding turf course. For the record, the fastest ‘Million yet run was Awad’s in 1995 final clocking of 1:58 3/5 (the race was still timed back then in fifths of a second) on a firm course. The slowest time was 2:07 3/5 on a soft course by John Henry in ’81 not that it matters. Fanfare goes hand-in-glove with the Arlington Million. There is actually an Arlington Million March, an original piece of music commissioned by Duchossois, which is played over the Arlington loud-(very loud) speaker system as the ‘Million horses parade to post. But, then, what sort of festival is it without noise? Duchossois has been known to institute other dramatic elements, as well. Kurt Becker, who served two years as Arlington’s track announcer, calling Star of Cozzene’s victory in the 1993 ‘Million and the triumph by Paradise Creek (a Bill Mott trainee) in 1994, tells this story. “It was in ’93. The night before the Arlington Million, a party was held at Duchossois’s breeding farm a short distance from Chicago. There were several hundred people there. We were greeted by an actor who was a John Wayne look-a-like. The party had a western theme I particularly remember that, because I had to go and buy a pair of cowboy boots earlier in the week. “There was a swimming pool near this huge house, the main house, on the farm, and the guests were all gathered around the pool and the lawn adjacent to it. Talking, drinking beer and wine. Suddenly, Duchossois rode up from behind the house on a white horse. And he was dressed as the Lone Ranger, complete with a white hat, black mask and six-guns. Becker further noted that throughout this demonstration, there was no sign of another rider playing Tonto. While Duchossois is a showman, he has never wanted to share the stage with anybody. In 1998-’99, there was no Arlington Million. That’s because Duchossois closed down Arlington Park for two years, as he sought tax and revenue concessions from the state of Illinois. There was some talk during those years of running the ‘Million at Saratoga, or perhaps during a late August, special meet at Keeneland, but neither of those things happened. In the spring of ’99, the Illinois legislature gave Arlington a package that included funds from a Cooke County riverboat casino and tax rebates. Duchossois announced that racing would return to Arlington the following year. He further pledged that the Arlington Million would be renewed even if the two year hiatus would cause the race to lose its graded status (it didn’t). Bailey won the ’00 ‘Million with Chester House. And he also won the ‘Million’s sister event, the Grade 1 Beverly D for fillies and mares, that same year with Snow Polina. No other jockey has ever duplicated Bailey’s feat. Today, Arlington Park is one of the tracks owned and operated by Churchill Downs Inc. Duchossis, now age 85, has the official title of chairman emeritus. Roy A. Arnold, who spent 30 years in the U. S. Marine Corps and was appointed Arlington’s president in 2006, is now in charge of the day-to- day operation of the track. This will be the fourth consecutive year that the ‘Million and Saratoga’s Sword Dancer will be run on the same day. Both for three-year-olds and upwards. The ‘Million’s a half-million bucks richer. The Sword Dancer is a quarter of a mile longer. A situation not good for racing, or for the sport’s fandom. But new chapters, new segments of history keep being added to the Arlington Million. Its ’06 running featured a wire-to-wire triumph by The Tin Man, who at the age of eight is the oldest horse to have won the race other than John Henry. True, the Grade 1 Breeders’ Cup Turf has replaced the ‘Million as the most prominent grass race in North America. But, query horsemen on either side of the Atlantic, and they’ll tell you that winning the Arlington Million remains a career-defining achievement.